The year is 2009. Nineteen-year-old Jackson Meyer is a normal guy… he’s in college, has a girlfriend… and he can travel back through time. But it’s not like the movies – nothing changes in the present after his jumps, there’s no space-time continuum issues or broken flux capacitors – it’s just harmless fun. That is… until the day strangers burst in on Jackson and his girlfriend, Holly, and during a struggle with Jackson, Holly is fatally shot. In his panic, Jackson jumps back two years to 2007, but this is not like his previous time jumps. Now he’s stuck in 2007 and can’t get back to the future. Desperate to somehow return to 2009 to save Holly but unable to return to his rightful year, Jackson settles into 2007 and learns what he can about his abilities. But it’s not long before the people who shot Holly in 2009 come looking for Jackson in the past, and these “Enemies of Time” will stop at nothing to recruit this powerful young time-traveler. Recruit… or kill him. Piecing together the clues about his father, the Enemies of Time, and himself, Jackson must decide how far he’s willing to go to save Holly… and possibly the entire world. I very much enjoyed Tempest. It reminds me of the movie The Butterfly Effect which I also loved. 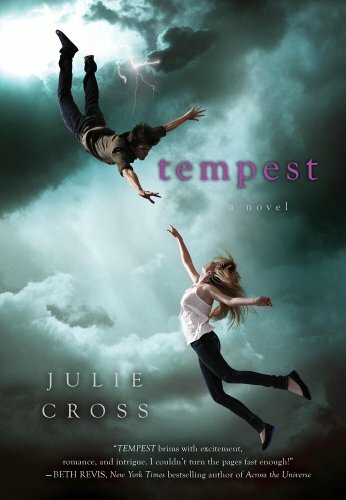 One thing I know romance readers won’t like too much is that Tempest is more for "guys". There’s a lot of action and not so much romance. I take that back. There's romance but it takes a back seat. The plot focus more on Jackson's ability to time travel which is fascinating by the way. I loved the main character, Jackson. I cared about him; his personality and charisma kept me entertain. The relationship between him and Holly seem realistic. They fought and got mad at each other but their chemistry was right on point. Another character I enjoyed was Adam. He was so… geeky and I loved it. The guy who narrates Tempest is a genius! I loved his voice and the way he changed his voice for every character. Because of voices like his I love listening to audiobooks. Share book reviews and ratings with Bethzaida, and even join a book club on Goodreads. Bethzaida has read 4 books toward a goal of 70 books. "Waiting On" Wednesday: Bitterblue Plus Giveaway!